87, of Yale, died Monday April 8, 2019. She was born October 15, 1931, in Yale, the daughter of the late Harvey and Dora (Cheney) Lett. Florence’s marriage to George Louis Weindl was October 23, 1948 in Yale. George passed away November 19, 1996. 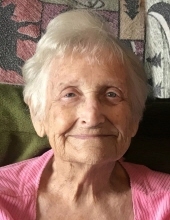 She loved to spend her time painting, tending to her beautiful garden of flowers, watching the birds, or running the roads shopping with her girls, but most of all, Florence loved and cherished time with her family. Surviving are two daughters and sons-in-laws, Luann (Sid) Noble and Lori (Eric) Burns and three sons, John, Mark, and Timothy (Samra) Weindl, all of Yale; 9 grandchildren, David (Jean) and Daniel Weindl, Justin (Tina) Noble, Trista (Jake) Shutko, Michael (Caitlin) Putze, Derek Burns, MacKenzie (Trevor) Burns, Seth Burns, and Heather (Chris) Harvey; her sister, Velma June Hoff; many great-grandchildren; brother-in-law and sister-in-law, Rupert and Marilynn Weindl, as well as many nieces and nephews. Arrangements provided by Kaatz Funeral Directors, Yale. Memorial service will take place on a later date. To send flowers or a remembrance gift to the family of Florence Joan Weindl, please visit our Tribute Store. Memorial Services will be on a later date. "Email Address" would like to share the life celebration of Florence Joan Weindl. Click on the "link" to go to share a favorite memory or leave a condolence message for the family.